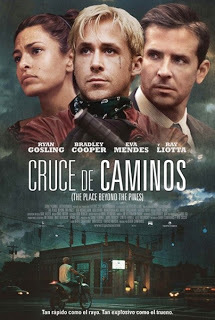 Reparto: Ryan Gosling (Luke), Bradley Cooper (Avery Cross), Eva Mendes (Romina), Ray Liotta (Deluca), Rose Byrne (Jennifer), Ben Mendelsohn (Robin Van Der Zee), Bruce Greenwood (Bill Killcullen), Mahershala Ali (Kofi), Harris Yulin (Al), Emory Cohen (AJ), Olga Merediz (Malena). Guión: Derek Cianfrance, Ben Coccio y Darius Marder. Producción: Lynette Howell, Sidney Kimmel, Alex Orlovsky y Jamie Patricof. Montaje: Jim Helton y Ron Patane. Productoras: Electric City Entertainment, Hunting Lane Films, Pines Productions, Sidney Kimmel Entertainment, Silverwood Films y Verisimilitude.